The latest film from director Richard Linklater (Dazed and Confused, Boyhood) is upon us and while last year's rockus spiritual sequel to the auteur's breakout hit was an equally fun and insightful time at the movies it looks as if Linklater has switched back to more somber material for his latest endeavor as Last Flag Flying follows a former Navy Corps medic Larry "Doc" Shepherd (Steve Carell) who re-unites with old friends thirty years after serving together in Vietnam to bury his son, a young Marine killed in the Iraq War. Doc's friends include ex-Marine Sal Nealon (Bryan Cranston) and Reverend Richard Mueller (Laurence Fishburne) with the dynamic and history between the three seeming to carry the weight of the majority of this film as each of the three leads come to learn more about themselves and the lives they've led thus far through both their offspring and those they've met along the way. Based on a novel of the same name by Darryl Poniscan who adapted his own work into the screenplay with Linklater co-writing this looks to blend a variety of things that Linklater does well behind and through the camera. If you've ever seen any of the Before films then you're aware how engrossing Linklater can make a movie that contains nothing more than two people talking. And so, if Last Flag Flying was little more than these three incredibly charismatic actors sitting in a car talking about their lives and experiences as directed by Linklater I'd have no doubt it would be stellar, but considering the magnitude and timeliness of the circumstances not to mention the weight of the baggage that each of these three men certainly carry there is a whole other level that Linklater will be able to work with and on. As for the trailer itself, this looks appropriately solemn with, again, the three lead performances seemingly balancing the complex and various human emotions such a story no doubt entails. Last Flag Flying also stars Yul Vazquez and Cicely Tyson and will have its world premiere at the New York Film Festival on September 28th before opening in limited release on November 3rd. 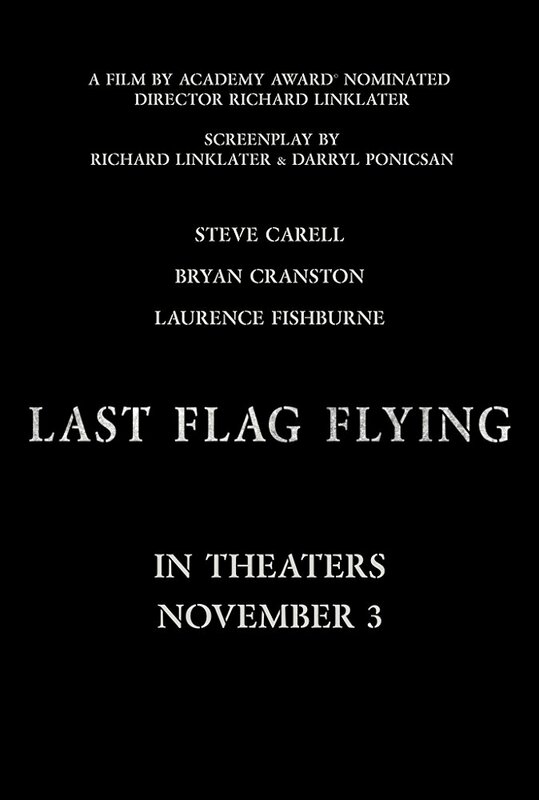 Synopsis: In 2003, 30 years after they served together in the Vietnam War, former Navy Corps medic Larry “Doc” Shepherd (Steve Carell) re-unites with ex-Marine Sal Nealon (Bryan Cranston) and Reverend Richard Mueller (Laurence Fishburne) on a different type of mission: to bury Doc’s son, a young Marine killed in the Iraq War. Doc decides to forgo burial at Arlington Cemetery and, with the help of his old buddies, takes the casket on a bittersweet trip up the East Coast to his home in suburban New Hampshire. Along the way, Doc, Sal and Mueller reminisce and come to terms with shared memories of the war that continues to shape their lives. Amazon Studios presents, a Detour film production, a Zenzero Pictures/Cinetic Media production, a Richard Linklater film.